In case you forgot, Bryce Harper now plays for the Phillies. Welcome to the rest of your career, Bryce Harper. Everyone in Major League Baseball thinks you stink. The baseball writers over at The Athletic published their now-annual players poll Tuesday, in which the website’s staff attempts to talk to as many baseball players as possible and unearth their hot takes. This year, The Athletic says, it talked to about one third of the league, so these answers are fairly representative of Major League Baseball as a whole. Phillies season preview: Can Gabe Kapler deal with 2019's high expectations? The most interesting question, of course, is who players think is the most overrated baseball player in the league. Since this poll is anonymous, there’s basically no reason for players to hold back. 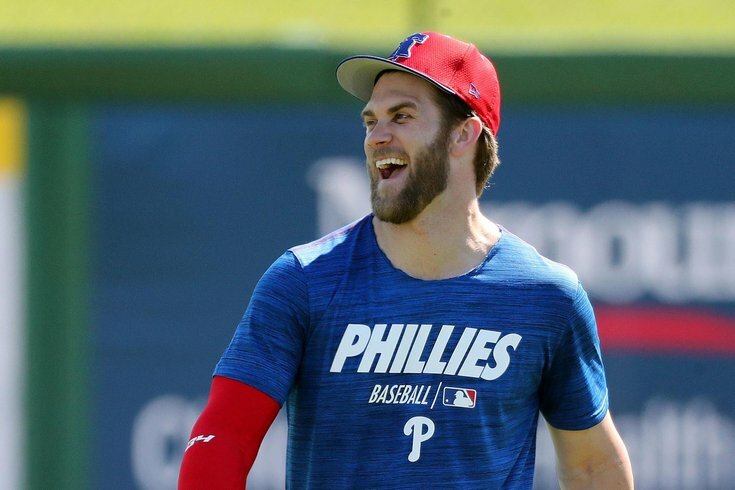 Two days before the Phillies take the field against the Braves on opening day, it seems Bryce Harper, the player to whom they just committed $330 million, isn’t exactly held in high regard. Harper ran away with the poll's “Most Overrated” title, garnering an insane 62 percent (!) of the vote. The runner-up was Blue Jays pitcher Marcus Stroman, who received just 4.1 percent of the vote. Manny Machado, the other superstar who chose a new team this offseason, picked up multiple votes, but no one came close to the animus Harper found across the league. Whew. Baseball players do not like Bryce Harper. For the record, Harper also received multiple votes for being Major League Baseball's "most intimidating hitter", and also its "dirtiest player". The team’s 26-year-old new face of the franchise has hit 184 home runs and 521 RBIs in seven years, though 22.8 percent of those home runs came in the aforementioned “one year”, his MVP season back in 2015. Last year, Harper hit 34 home runs and 100 RBI and led the league in walks with 130, but also posted a slugging percentage, on-base percentage, and batting average all well below the league leaders. If he hadn’t just landed an enormous contract, Harper probably wouldn’t have run away with this ignominious title, though it’s likely he still would’ve landed close to the top. All Harper really needs to focus on right now, of course, is winning over Phillies fans. They’re the ones who’ll most vocally hold him accountable to that mind-boggling contract, and they sure won’t do it anonymously.